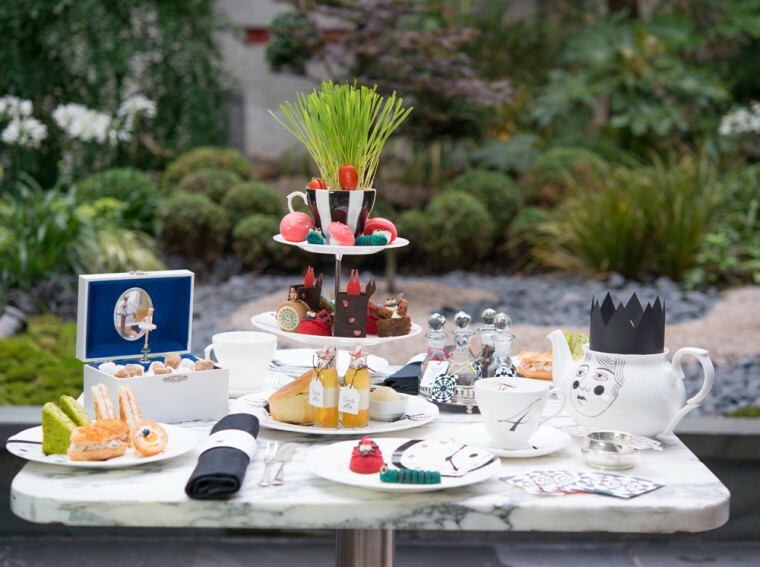 Although there are a few variations on the ‘Mad Hatter’s Afternoon Tea’ going round London, the one that perhaps caught the public imagination was the original version at Sanderson London. Despite sometimes feeling as if I’ve eaten every possible afternoon tea in London, I somehow managed to miss this one and was just a little disappointed. 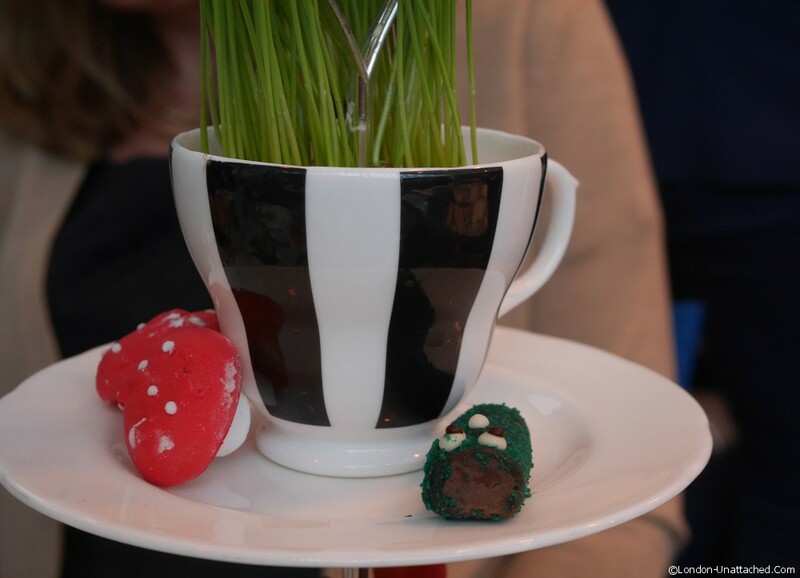 No need to worry though, celebrating 150 years of Alice in Wonderland, the tea has been re-invented and is back, reportedly better than ever. And, I got an invitation to check it out. 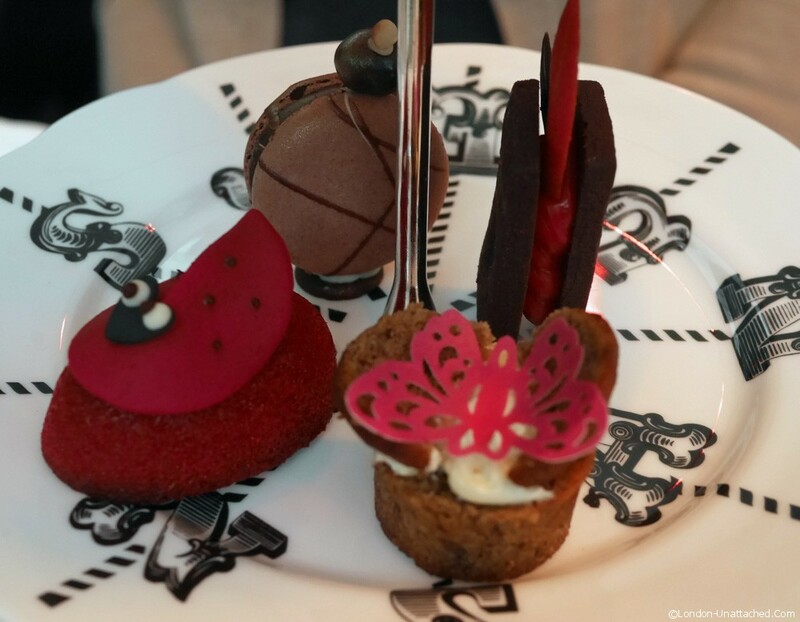 Of course Sanderson London is quite a surreal place even without the afternoon tea. The giant Marilyn Bocca lipstick sofa in the lobby, the decadent purple bar and the tranquil Japanese styled courtyard garden around which tea is served are just a few examples. I remember staying in one of the bedrooms when it first opened. Right in the middle of the room was a giant egg, big enough to drape a coat over. I suspect it has gone now, part of a recent refurbishment – but who knows? 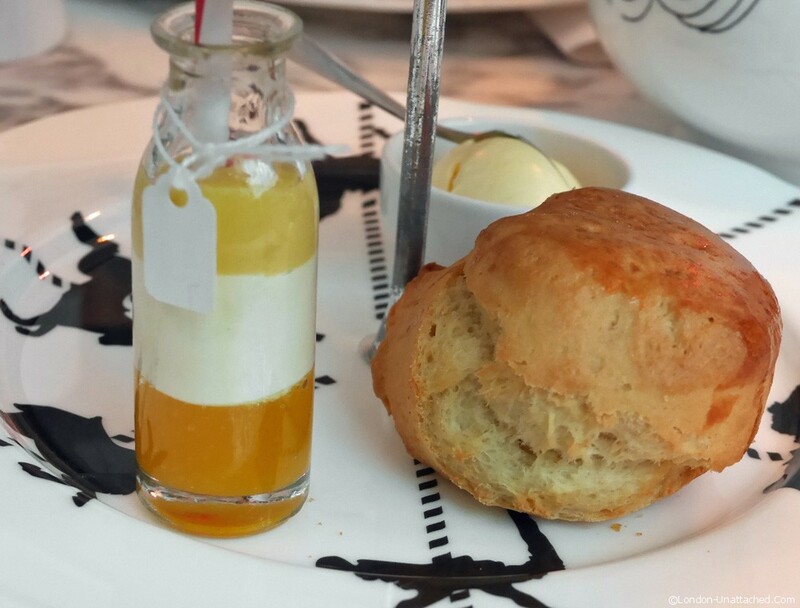 Afternoon Tea here simply takes things to the next level. You do wonder if the creator had taken a good helping of one of Alice’s potions. Even the menu arrives hidden inside a vintage book. 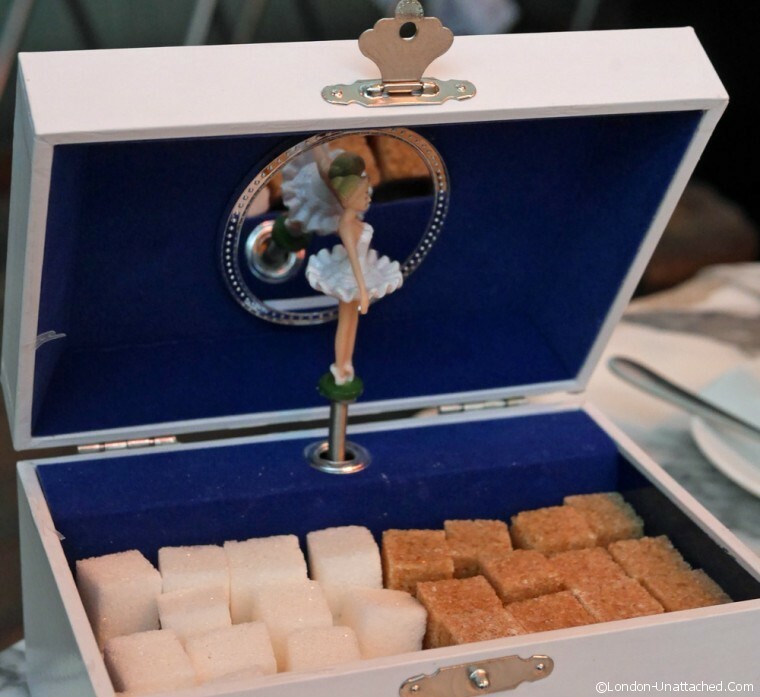 And sugar is served courtesy of the Sugar Plum Fairy. Helped along by a glass of Perrier-Jouet champagne we picked from the tailor made floral scented teas, presented in pretty cut glass decanters. Then, our tea towers appeared. One each because I am allergic to strawberries, so a number of the sweets were changed for me. 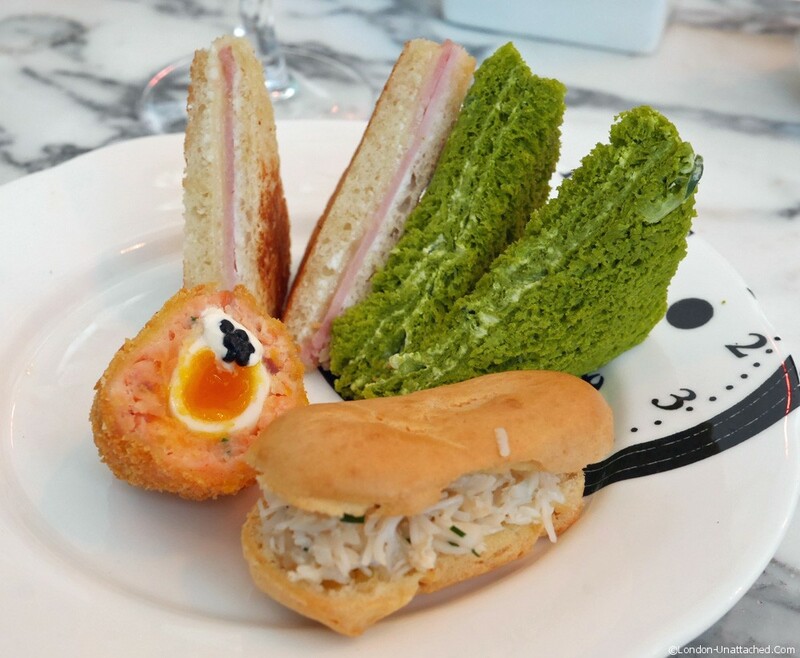 The savoury plate had the sort of scotch egg I love – with smoked salmon, a quail egg and a dollop of caviar. A tiny croque monsieur was crisp and light, filled with Wiltshire ham and smoked applewood cheese. The Cornish crab and herb eclair looked just a little clumsy, but tasted divine. And, classic cucumber and cream cheese sandwiches were transformed, served on vivid green lime bread. Scones with jam and clotted cream next. Nothing particularly remarkable here, though that may simply have been because we were both eager to start tasting the pretty sweets and fancies. We did also get a tiny ‘drink-me’ potion – a delicious fruity compote mixture. And the White Rabbit’s pocket watch macaroon. It was one of those occasions where I really wanted to just try the Wonderlands magic marshmallow mushrooms and the red velvet ladybird, both of which were missing from my tea tower because they contained strawberries. 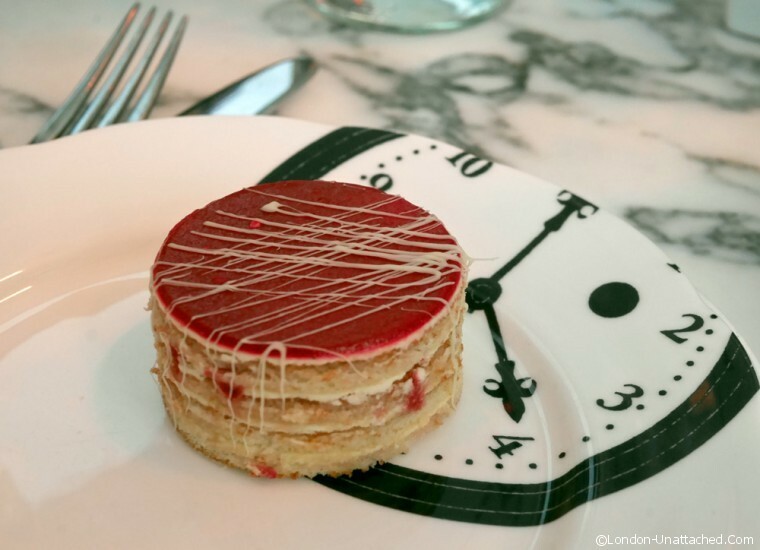 I wasn’t disappointed though by the pretty raspberry millefeuille and all credit to Sanderson London for taking such care to make sure there were no allergens on my tower. By the end of the tea, we were both quite full and instead of taking any second helpings we were offered a box of cakes to take home. And, just to round things off nicely, a miniature planter arrived with flower pots. Chocolate ‘earth’ and honeycomb ‘boulders covered the passion fruit ice. What a pretty way to end the tea. 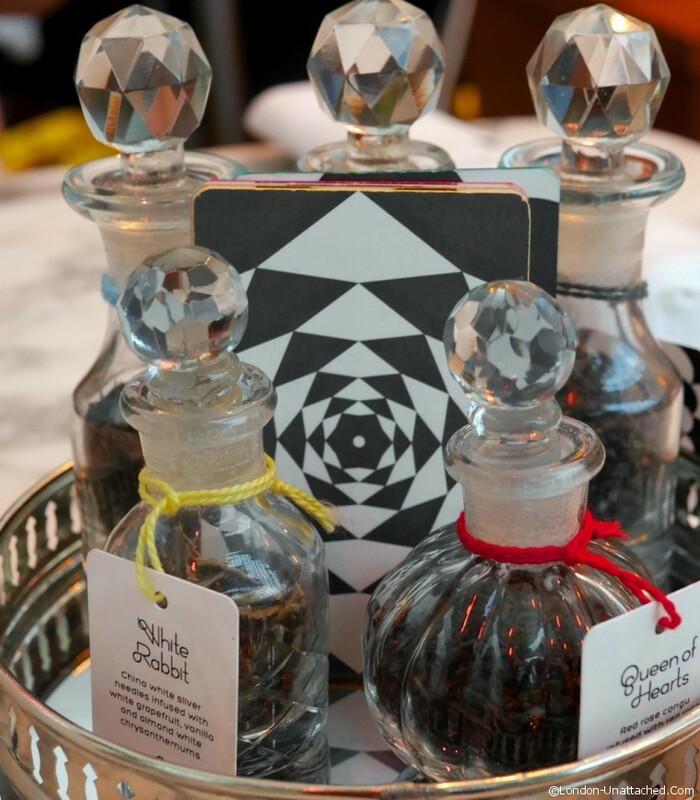 Sanderson London is a stunning hotel and the courtyard setting for the tea is unique. 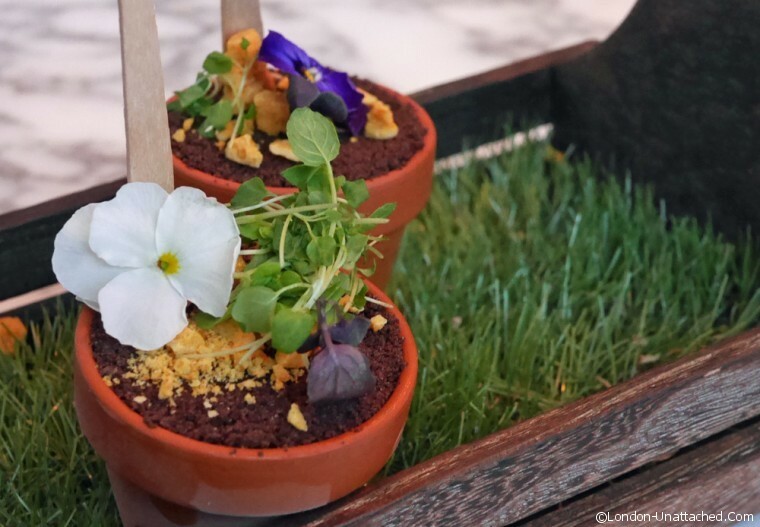 This reinvention of the Mad Hatter’s Teaparty is light and delicate – every cake stunningly presented and carefully balanced in flavour as well as being visually attractive. It is quirky and fun and would make a great diversion for anyone shopping on Oxford Street. 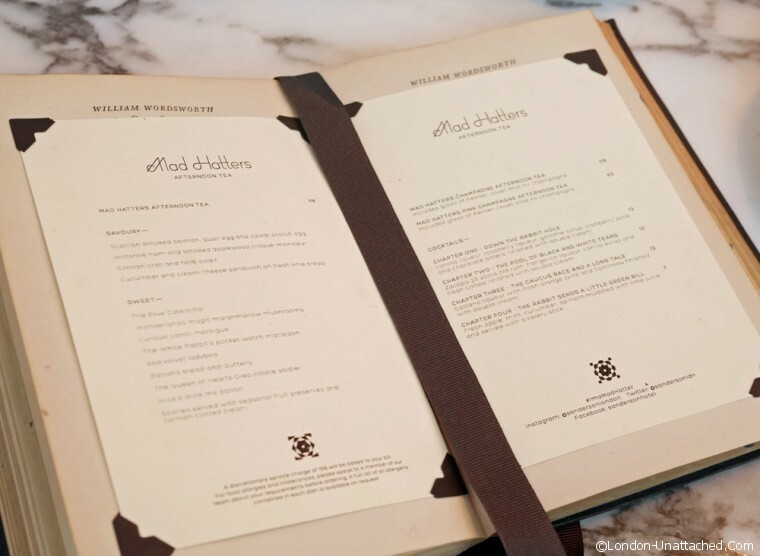 Tea is served daily and is priced between £48 and £65 per person excluding service, £35 per child for children 4-11 years old.For table reservations, please call 020 7300 5588.